Amazing Kids! Is proud to highlight the Amazing Kids! Of the Month! Each month, we showcase kids who are accomplishing amazing things. We hope that by telling their special stories, we will inspire other kids to accomplish their own amazing achievements. 18-year-old Marika Racibarskas is the kind of teammate any team would love to have on their team. A high school senior and captain of her volleyball team at Chatham High in Chatham Township, New Jersey, Marika is a natural athlete, with talents that have helped her excel in several sports. The sport she is most passionate about, however, is volleyball! Her passion for the sport, along with her amazing innate athletic abilities, her winning “can do” attitude, and her willingness to work hard, have helped propel her to the top of her sport among the nation’s female high school players, and has helped her garner national recognition for her talents. Read Marika’s amazing story below, and be prepared to be inspired to find–and follow!–your own passion in life! Don’t forget: If you, or a young person (or persons!) you know, has an amazing project you are involved in, or a special skill, talent or ability you want to tell the world about, be sure to let Amazing Kids! know about it! Simply complete our Amazing Kids! of the Month award online nomination form, or email us! As the senior setter for the Lady Cougars volleyball team at Chatham High School in New Jersey, and standing at 5- foot 11-inches tall, Marika Racibarskas, age 18, is an athlete with a great attitude and a laser-sharp focus on the court. As the team captain, Marika helps keep her team in their game, and is always a strong presence and support for her teammates. But becoming a winning athlete isn’t easy. Throughout her high school years, Marika has worked incredibly hard to become the best she can be at the sport. She has been fortunate to be able to train with devoted coaches, exceptional trainers and to be able to play with outstanding team members. She also has spent much of her life playing the sport. 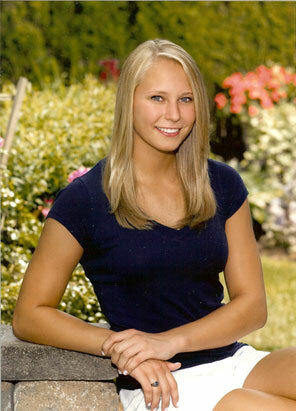 Marika began playing volleyball as a young child while attending a Latvian summer camp in the United States each summer. In fact, she attributes her Latvian heritage as being key in fostering her interest in and passion for the game. Marika explains that in Latvia, volleyball is a popular sport for men and women of all ages. Children, teens, adults, even grandparents play volleyball, and everyone seems to be equally enthusiastic about the game! Marika attended a Latvian Language School and continued playing volleyball at the Latvian summer camp for six weeks every summer. Last summer was her final summer at the camp, and Marika was pleased to be able to end her camping days at the camp on a high note: the team she played on won the summer championship! Although she completed the language program and graduated from the language school last summer, Marika says she is grateful to have had so many wonderful summer experiences. 2007 New Jersey State High School Volleyball Championships! At home in New Jersey, volleyball is a way of life for Marika. She began playing in high school when she secured a place on the team quite accidentally. Before the start of the season, the school coach was seeking a setter to fill in on the volleyball team. Marika’s older sister, Katrina, also a champion volleyball player now in her sophomore year at Lafayette University in Pennsylvania, immediately recruited her to play. Now, four years later, as the dynamic senior setter for the Lady Cougars team at Chatham High, Marika continues to be a valuable asset to her team. In 2007, she led the Lady Cougars to win their first Group Two State Championship title. She is a leader who plays a very significant role. On the court, amazing Marika is known for her quick vision. Along with her natural athletic ability, Marika is an amazing “team player” who works hard, displays a fantastic attitude, and is truly dedicated. Marika fully understands that all team members must work together to thrive and win. 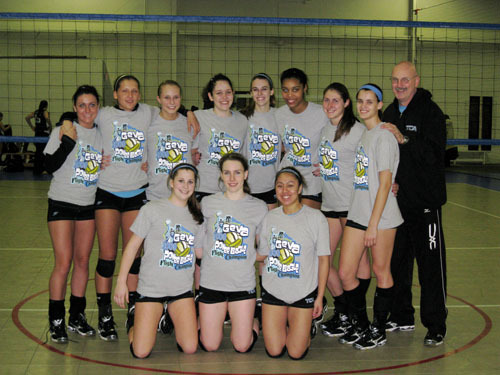 In addition to her high school team, Marika plays on a club team in New Jersey, the TCA NJ 18 Black. Her club team has played in numerous tournaments across the United States, and her experiences with the them has helped her hone her amazing volleyball skills even more. All of this hard work and preparation has brought many awards and much recognition for this rising star in the volleyball world. Marika has not only proven to herself, her coaches and her high school and club team that she is an extraordinary high school volleyball player who is able to lead her high school and club teams to victory. She has also gotten the attention of the college recruiters, and as a result has received countless offers from U.S. colleges to join their women’s team. Marika’s first choice, however, was Penn State, the 3-time NCAA National Women’s Volleyball Champions who have won back-to-back national championships for the past two years. In September, Marika will be joining Pennsylvania State University’s outstanding women’s volleyball team, the Nittany Lions, the 2007 and 2008 NCAA champions. Currently undecided as to what her major will be, Marika says she is leaning towards studying either Kinesiology or Communications. She hopes to continue her amazing volleyball career beyond college and possibly coach volleyball one day. Amazing Kids! wishes Marika much luck and many incredible accomplishments ahead in her college volleyball and academic career! We are looking forward to hearing all about her amazing collegiate volleyball feats while at Penn States. Star player Marika’s amazing future awaits. Her talents, determination and winning attitude will surely help her star continue to rise even higher, as she makes her move into the exciting world of collegiate and professional women’s volleyball! AK: When did you first realize volleyball would be your sport? Marika: Growing up, I always played volleyball in the summer at my Latvian summer camps. In middle school, I played four sports at one time (volleyball, soccer, gymnastics, lacrosse), all of which I loved. However, time commitment quickly became a problem. When the time came to choose, volleyball was the clear choice. My passion for volleyball surpassed my passion for all other sports I played. AK: Explain what you do as setter on the volleyball team at Chatham High School. Marika: At Chatham High School, my role was to be the leader on the court. Even as a freshman, I was asked to take on a leadership role. As a senior captain, my main goal for the season was to mentor the younger players, help them develop their skills and gain a better understanding of the game. AK: Describe your exercise routine during the season. Marika: I confess that I am a gym rat! On the days that I don’t have volleyball practice, I spend almost three hours with my trainer working on strength, speed, and explosiveness. My club team practices three times a week in order to prepare for local and national tournaments with the hope of winning a bid for the Junior Olympic tournament held in July. AK: How has your family supported your goals? 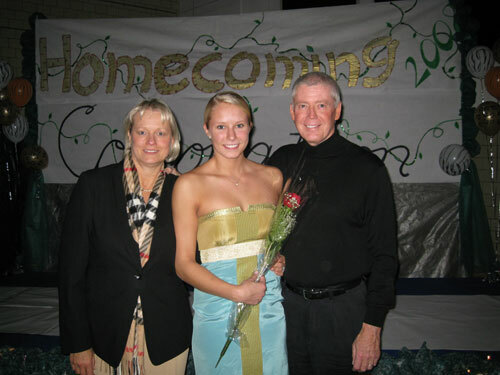 Marika: My family has been the greatest support system a kid could ever ask for! They have sacrificed much of their own time to drive me to games, practices, etc. Most important, they have encouraged me to pursue what I love and give 100% to whatever I do. I feel very lucky that my family is incredibly supportive of my choices. AK: Fast forward 10 years—what might you be doing? Marika: In 10 years, I hope to be playing beach or international volleyball. If for some reason I am unable to continue my playing career, I hope to be coaching a collegiate team or junior players. Learn more about Amazing Kids!’ Launch My Dream! initiative and help us help kids like Marika launch their dreams! If you are doing some amazing things too, we want to hear about it! Tell us about your amazing accomplishments, so we can tell the world just how amazing you are! We are always looking for new stories. And don’t be shy! We’d love to hear from you! WHY NOT HELP OTHERS SEE THEIR OWN POTENTIAL? If you know someone who needs a little encouragement, why not tell them what you think is special about them? Maybe you can be the one to help them uncover their own special talent.